How to Import AVCHD MTS/M2TS to Windows Movie Maker for editing » AIC Converter-Import AVCHD/MTS to FCP/FCE/iMovie How to import MTS files to iMovie on Mac Mountain Lion/Mac OS X Lion etc.? How to Log and Transfer MTS to Final Cur Pro (X)? How to edit MTS footage in iMovie? How to import AVCHD files to Final Cut? How to Convert AVCHD/MTS to PorRes? How to encode AVCHD MTS to AIC .mov? 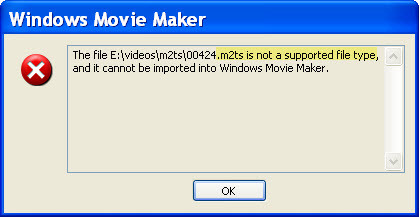 Why Windows Movie Maker can not play MTS files from my JVS HD camera? As we all know, Windows Movie Maker is the free video editing software installed on a PC using Microsoft Windows OS. However, probably because of the copyright issues, Windows Movie Maker only provides supports for a relative small range of formats. Unfortunately, the most popular AVCHD MTS/M2TS footages captured by a Panasonic, Canon or Sony camera/camcorder are out of the range. That means to edit MTS/M2TS files with Windows Movie Maker, you have to do format conversion to obey the format restrictions of WMM. So I wrote this Guide to help you solve how to use MTS to Windows Movie Maker Converter to convert JVC HD MTS to Windows Movie Maker compatible format without crashing problem and avoid rendering. The top AVCHD MTS Converter is specially designed for Sony, Canon, JVC and Panasonic AVCHD Camcorder/camera owners to convert MTS to AVI, convert MTS to MOV, convert M2TS to WMV, convert MTS to MP4, convert MTS to MPG, convert 3D MTS to any file format etc. 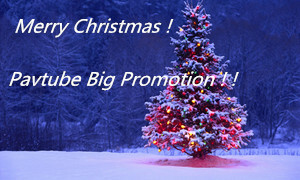 with excellent audio and image quality for using in video editing software and multimedia devices. Step 1. Import .mts files to MTS to Windows Movie Maker Converter. Download Pavtube MTS to WMM Converter, install and run it. Once run it, you can click “Add Video” button or “Add from folder” button to load your .mts and .m2ts AVCHD files from JVC or other camcorders. Step 2: Select WMV as output format and set destination folder. Click the pull down menu of “Format”, then you will be able to select a Windows Movie Maker supported format from the output format profile, we choose “Format > Common Video > WMV3 (wmv9)(*.wmv)” as the format for Windows Movie Maker. 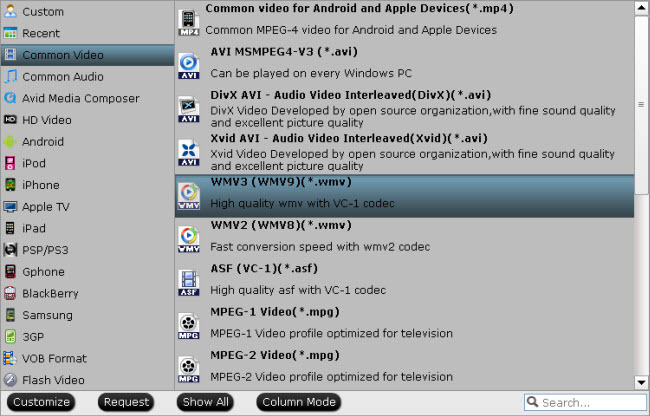 Or you can also choose “Format > HD Video > WMV HD (*.wmv)” as output format. Meanwhile, click the folder icon at the end of “Output” to specify where to save the output files for your WMM, if not, this program will export them to the default save path automatically. BTW, if you want to combine multiple .mts and .m2ts files into a single file, you can tick off the checkbox “Merge into one file” to realize this goal. Click “Settings” button, then you will be able to adjust audio and video parameters on the popup window to customize the output file quality, these adjustable parameters include codec name, aspect ratio, bit rate, frame rate, sample rate, and audio channel. 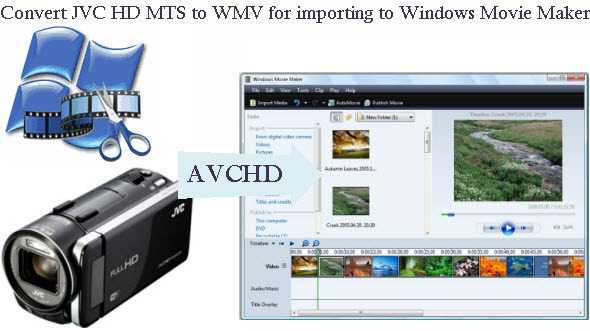 Step 4: Convert JVC MTS to WMV for importing to Windows Movie Maker. Click “Convert” button to start converting. Once the conversion is finished by MTS to Windows Movie Maker Converter, you can click “Open” button to get the output files effortlessly, and now you are ready to import Video files to Windows Movie Maker for editing. Just import the converted files to Windows Movie Maker for editing via its “Import video” option. You can import a video clip into a brand new Windows Movie Maker project or add a video clip to an existing movie in the works. 1. Important – Make sure that all components of this project are saved in the same folder. 2. 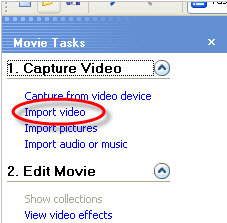 In the Tasks pane on the left side of the screen, click on Import video under the Capture Video section. It looks like all the ideas you’ve got offered on the write-up. They’re genuine which enable it to definitely function. Nevertheless, the actual discussions are way too short for beginners. May you want stretch them a lttle bit from pursuing period? Appreciation for the actual article.